McClintock Distilling has teamed up with The Frederick Film & Music Festival as well as The Sweet Farm Food Truck to bring you a midweek dinner and a movie. Socialize, network and help raise money for The Frederick Film & Music Festival and their upcoming special events. Who doesn't love great local food and great movies? For our first Films & Fermented Foods Night, Rachel from The Sweet Farm will be providing guests with a delicious sausage, pickle, full sauerkraut bar and a ginger beer made with used raw materials from our Forager Gin ;) with plenty of Monocacy Brewing's product available as well! 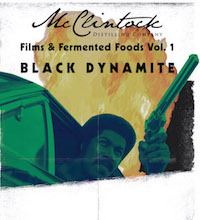 Then enjoy a beer or 5, sit back relax and watch Black Dynamite! "He's Super Cool and He Knows Kung-Fu!" Buy an advance ticket for just $15. Your ticket will include admission & reserved seat for the movie screening, a full meal provided by The Sweet Farm, donation to The Frederick Film & Music Festival and two automatic raffle entries. There are just 50 advance only tickets available. 21+ Beer & Wine will be available throughout the night. If you have any food allergies please message us directly or notate it when you purchase your ticket. We hope to see you there! Subscribe to the event for updates!